Take 42% off the entire course. Just enter code slklepatch into the discount code box at checkout at manning.com. DApps, or decentralized applications, are blockchain-based applications that run autonomously on a peer-to-peer network. Because neither the data nor the processing are controlled by a single entity, DApps promise to disrupt business models across every industry, including centralized government services! 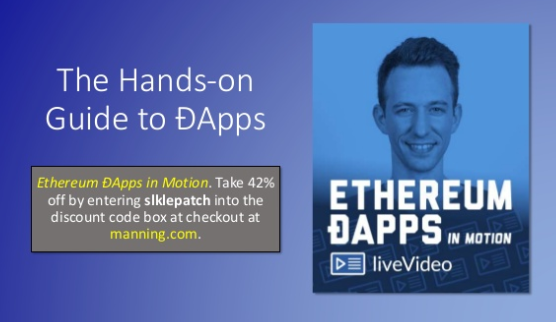 In Ethereum DApps in Motion, blockchain and cryptocurrency expert Julien Klepatch teaches you to build DApps on the Ethereum blockchain platform. You’ll get hands-on experience with real-world exercises in this engaging liveVideo course, featuring straightforward instruction and clear graphics. 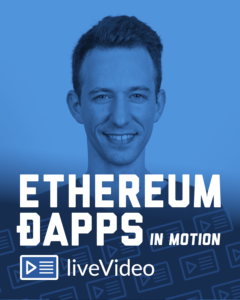 Master the skills covered in this engaging video course, and you’ll be in on the ground floor of the DApp revolution! Manning's focus is on computing titles at professional levels. We care about the quality of our books. We work with our authors to coax out of them the best writing they can produce. We consult with technical experts on book proposals and manuscripts, and we may use as many as two dozen reviewers in various stages of preparing a manuscript. The abilities of each author are nurtured to encourage him or her to write a first-rate book. Enter in the Promotional Code box when you check out.